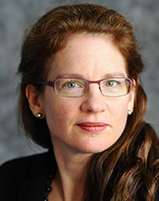 “The 5th edition of the Germán Bernácer Prize has been awarded to Prof. Stephanie Schmitt-Grohe (University of Columbia) for her important research devoted to developing and applying the tools for evaluation of macroeconomic (fiscal and monetary) stabilization policies in the context of economies subject to nominal and real distortions”. Stephanie Schmitt-Grohe (Germany) is a professor of economics in the Department of Economics at Columbia University in the City of New York. She is a research associate of the National Bureau of Economic Research and a research affiliate of the Centre for Economic Policy Research. She got her Bachelor Degree in Economics at the University of Münster, in 1989 she studied a Master Degree in Finance at Baruch College and in 1994 she obtained her PhD in Economics at University of Chicago. Her research have primarily focused on macroeconomic issues, in particular monetary and fiscal policy in the open and closed economy. In 2011, she received the National Science Foundation Grant (jointly with Martin Uribe). She has published widely cited papers in leading journals like American Economic Journal, American Economic Review, Econometrica, Journal of Finance, Journal of Political Economy, etc. The award ceremony took place in Madrid, on June 29th, 2005.